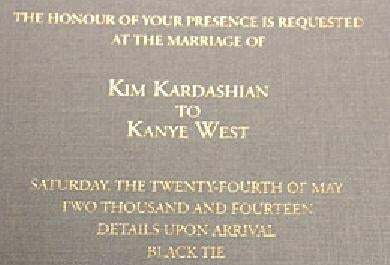 LOS ANGELES – As rumors abound and details are slowly released, the upcoming wedding of celebrities Kim Kardashian and Kanye West has fans, friends, and reporters alike excitedly speculating on the future of the soon-to-be married couple. "I just know with all my heart that these two will stick together well into their old age, staying faithful and committed through the darkest, most difficult times of married life, only to grow closer and more in love with each other over time," thought not one person even vaguely familiar with the couple. The wedding will mark the first marriage for West, a music producer and performer known for tracks such as "Gold Digger," "Jesus Walks," and "I Am a God." For Kardashian, star of the reality television show "Keeping Up With The Kardashians," it will be her second marriage; in 2011, she wedded NBA player Kris Humphries – a highly-publicized sacrament which spanned 72 exciting days. "I expect that, after Kim and Kanye are married, they're going to be that rare celebrity couple which bows out of the limelight, focuses on growing their family in private, and doesn't turn their married lives into a spectacle," predicted absolutely no one. Adding to the excitement around the upcoming nuptials is the recent birth of daughter North West, the couple's only pre-marital offspring, who will celebrate her first birthday just weeks after her parents' May 24 wedding. "I think we all know that baby North will grow up to be a humble, polite, and well-adjusted child," no one in their right minds believed. "Honestly, with role models like Kim and Kanye, what else could you expect? There should be no doubt that they will instill her with values like kindness, responsibility, selflessness, and teach her how to use her good fortune to help people," said not a single soul. "If I know Kim and Kanye, I wouldn't be the least bit surprised if North decides to devote her life to altruism: perhaps serving the underprivileged, healing the sick, and finding any way to use her circumstances to do real good in the world by eschewing the temptations and trappings of extreme materialism. Maybe she will become a scientist or a teacher." "But whatever she wants to be, it's just a great thing that she will always be able to count on her parents to raise her together," nobody said.